Houston Texans running back Arian Foster will miss the first several weeks of the 2015 NFL season due to a groin injury which will require surgery. Foster, 28, was hurt in Monday's practice -- the first fully-padded practice of Texans' training camp-- and now adds another groin problem to the list of what has been a long line of soft tissue ailments that have plagued him throughout his career. A groin injury forced him to miss two games in 2014, and the former undrafted free agent spent several weeks of the 2013 season on the sidelines due to a back issue. He suffered two separate hamstring issues during the 2011 preseason and has often battled soreness and tightness in those muscles over the years. Foster, who led the league in rushing in 2010, and has been elected to four Pro Bowls, will almost certainly be headed for the reserve/designated to return list, meaning week 10 could be the earliest chance the former Tennessee Volunteer has to return to action. 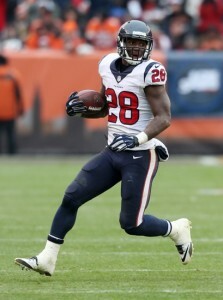 Alfred Blue will be first in line to replace Arian Foster in the Texans' lineup. In the meantime, Houston's backfield duties will fall at the feet of Alfred Blue, Jonathan Grimes, Chris Polk and rookie Kenny Hilliard. The Texans will likely scour the free agent pool and trade market in an attempt to bolster their ranks at the tailback spot while Foster recovers. Blue's skill set profiles that of a third-down specialist and change-of-pace type, but he performed well as a feature back in Foster's absence last season, including a 156 yard performance against the Cleveland Browns in week 11. Blue, who will likely be first in line for touches in Foster's stead, left Monday's practice with what appeared to be cramping issues, but is expected to be fine. The 24-year-old finished his rookie year with 528 yards on the ground and two touchdowns. Hilliard, Blue's former LSU teammate, was taken in the seventh-round of May's NFL Draft, and like Polk, has the attributes of a short-yardage and goal line back. Grimes, a versatile 25-year-old who has added value as a backfield receiver, will also be in the mix for work as Houston presses on without their lead back. Foster, whose injury has been described as "severe" by the Houston Chronicle, is in the fourth season of the five-year $43.5 million deal he signed with the Texans in 2012. While no date has been set for the procedure, and thus, no exact recovery timetable given, the injury will almost certainly rule him out until November, if not later. His loss is a major one for Houston, who has built its offensive attack around Foster's rushing ability. The Texans, who have yet to settle on a starting quarterback, will now have to rely on a relatively unproven group of backs and a passing game that is still a work in progress.